Facade pattern is one type of structural pattern, which hides the complexity of the system and provides an interface for clients to access the system. Every abstract factory is a facade pattern by default. Client can easily interact with the system applications. Sub systems can be easily accessed. Facade: Facade is used to hide the implementation details of code. The clients can interact with facade but cannot interact with the subsystem. Creating a class Triangle which implements the interface Design. Creating a class Rhombus and implementing the interface Design. Creating a class Circle which implements the interface Design. Creating a Facade class DesignMaker. 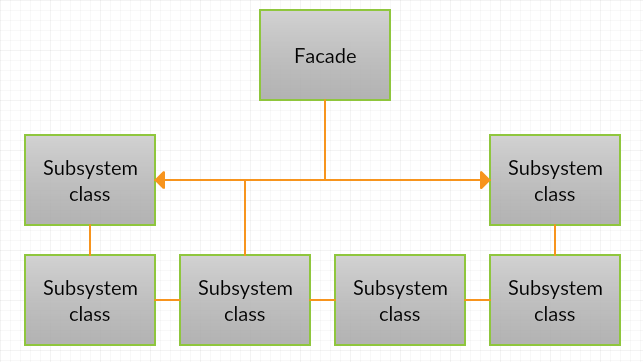 Creating a main class FacadePattern. Façade Pattern – Complexity is reduced. Façade Pattern – Interface is designed to provide access to the client.